The procurement software is primarily used for the execution of the online ordering process and matching the invoices of the materials obtained by the orders. It helps to pay the bills electronically. Procurement software automates the whole process starting from the purchasing to the management of the inventory. It approves the online orders, match the invoice and track all the scheduled payments. It generates electronic requests for the proposal and it also enables the electronic requests for the information and quotation. It applies the integrate business solutions in order to improve the overall business. The advantage of using the procurement software is that it reduces the external cost associated with the process and also enhances the process efficiencies. The global procurement software market is observing vibrant growth on the account of increasing demand from the various organizations in order to enhance the sales channel. The suppliers are enhancing the various delivery models in order to increase the sales channels. Additionally, the application of the procurement software improves the transparency in the generation of the invoices and automates the procurement activities. The increasing need for the improving the supply chain is anticipated to be the major driver for the overall procurement software market. The complexity involved in the demand supply management is major concern for the various businesses. The suppliers are increasingly focusing on improving the business operations by the integration of the technology. The automation process improves the transparency and enables the customer to get the detail invoice of the product. The growing technological development and increasing advancement in the technology provides key opportunities for the market players in order to establish themselves in the procurement software market. The key players are anticipated to garner opportunities related to the procurement software. This is anticipated to boost the growth of the overall procurement software market during the forecast period. The application of the procurement software requires expert professionals in order to operate the software. Thus, lack of the skill professionals related to procurement software is expected to restrain the growth of the market. On the basis of regional analysis, global procurement software market is segmented into five major regions including North America, Europe, Asia Pacific, Latin America and Middle East & Africa region. North America is anticipated to lead the overall market during the forecast period. 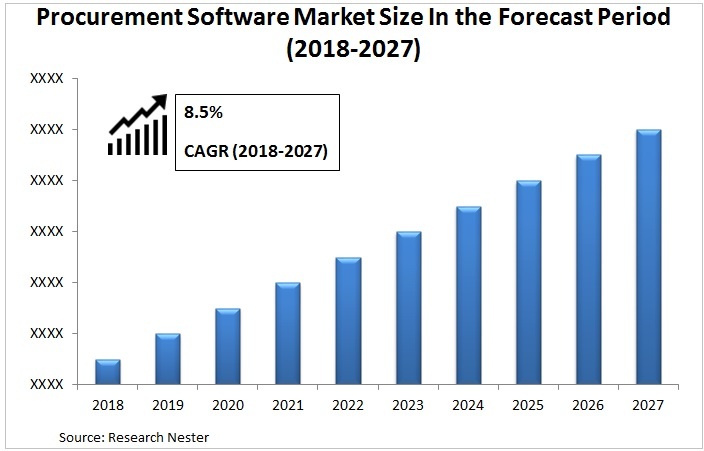 The presence of the various end-users industries in the region coupled with the presence of the key market players such as Oracle and IBM in the region is expected to boost the growth of the procurement software market. Asia-Pacific is anticipated to showcase substantial growth in the procurement software market. The growing industrialization in the region is anticipated to boost the growth of the overall procurement software market during the forecast period. Additionally, the developing telecom sector in the region increases the demand for software’s is expected to boost the growth of overall market. For instance according to India brand equity foundation, the internet subscription in 2012 was 22.86 million whereas it grew to 493.96 million in 2018.The government framed National Digital communication policy in 2018. According to this policy, government has the target to provide universal broadband connectivity of 50Mbps to every citizen and also expand the IoT ecosystem to 5 billion connected devices by 2022.